Biola University’s first endowed chair has been established in recognition of William Lane Craig, a world-renowned philosopher and theologian who has been teaching at Biola’s Talbot School of Theology for more than 20 years. Funded through a generous donation, the William Lane Craig Endowed Chair in Philosophy will permanently create a faculty position at Talbot in honor of Craig’s ongoing legacy. It is the first endowed chair established at Biola. Lawrence “Wayne” Swindel and his wife, Sandra “Ronnie,” have generously offered a planned gift of $3 million for the endowed position, which meets more than half of Biola’s campaign goal for endowed chairs and lectureships. This gift will support Biola’s ambition to become a global center for Christian thought and continue its mission to cultivate and disseminate influential scholarship that will speak to critical world issues from a solidly biblical perspective. Craig, research professor of philosophy at Talbot, is popularly known for his many public debates, including one with the late popular atheist Christopher Hitchens; his many books, including Reasonable Faith: Christian Truth and Apologetics; and his wide-reaching online ministry at Reasonable Faith (reasonablefaith.org). 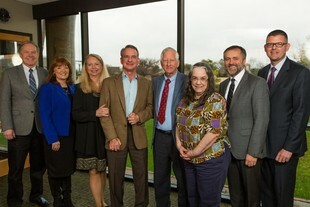 The Swindels are personal friends and long-time supporters of Craig and his wife Jan, and have sat under Craig’s teaching in the Defenders class at their home church in Georgia. Wayne Swindel hopes the establishment of this chair will carry Craig’s legacy into the future and provide greater opportunities for academics following in Craig’s path. With this generous gift, this endowed chair will ensure a permanent faculty position, providing greater access to new scholarly opportunities for both faculty and students. Biola will continue its efforts to influence the world of ideas by developing funds for endowed chairs and lectureships. “Hopefully, going forward, the chair will become fully established and provide incentive and motivation for others to follow a similar route and make contributions that would establish chairs in other people’s names,” Swindel said.